Fan favorite Detective Tracy Crosswhite is back in action in A STEEP PRICE, the sixth installment in Robert Dugoni’s highly acclaimed police procedural series. Since the 2014 release of MY SISTER’S GRAVE, readers have followed Tracy through the resolution of her sister’s murder case, finding love with lawyer Dan, and more than a few headscratchers at the Seattle Police Department. But now Tracy is tackling an entirely new challenge: pregnancy. Only four months into her pregnancy, Tracy is finishing up testimony in court when she is called to consult on a missing persons case. Forever walking a thin line with Captain Nolasco, Tracy has not yet revealed her pregnancy to anyone but her partner, Kins, and must tread carefully when taking on any new projects that Nolasco may deem superfluous --- and a young woman who has only been missing for 24 hours is definitely superfluous. That said, Tracy’s instincts are always dead-on, and when she learns that the young woman, Kavita, was estranged from her conservative Indian family over her unwillingness to take part in an arranged marriage and was putting herself through medical school, she knows that something just isn’t right. When Kavita’s body is discovered in a hole in a nearby park, her suspicions are confirmed, but with the family not talking and no solid clues, it will take all of Tracy’s strength of mind and determination to find justice for Kavita. "One of the strongest elements of Dugoni’s books has always been his ability to balance numerous plotlines, characters and twists without ever confusing or distracting the reader. In A STEEP PRICE, he is at his absolute best, juggling several timely, personal and riveting storylines without a single misstep." At the same time, Tracy’s colleagues, detectives Del Castigliano and Vic Fazzio --- that’s Del and Faz to us longtime fans --- are working a new case in South Park. A young activist, Monique Rogers, has been murdered in broad daylight in an apartment courtyard, and impossibly, no one saw anything. Monique was outspoken against the proliferation of drugs and gang violence in South Park, and it appears that her work made her a target of Little Jimmy, the son of a notorious gang leader who has followed in his late father’s (Big Jimmy’s) footsteps. Unfortunately, Little Jimmy has long believed that Faz was directly responsible for his father’s death, making this case a lot more complicated for all involved. Add to that the community’s fear of speaking out against the gang, and you have another nearly unsolvable case. Tying these two plotlines together is Detective Andrea Gonzalez, the newest member of the A-Team. Tracy believes that Andrea has been brought on to fill her place when she is forced to take maternity leave, but as she has not yet informed Nolasco, readers can initially chalk this up to paranoia. However, when Andrea shoots an unarmed man while on assignment with Faz, it becomes clear that there is something fishy about this new addition to the team. As Tracy tries to find out what happened to the ambitious Kavita while hiding her pregnancy from the squad, Faz finds himself at the center of a brutal department investigation that could mean the end of his future with the force. Dugoni explores several hot-button issues here, from body cameras on officers to use of excessive force and even arranged marriages and sugar dating. He is a smart, thorough researcher as much as he is a skilled and imaginative writer, and readers will learn a ton from this book. His insights on police work are particularly keen, especially when he introduces FIT, the Force Investigation Team, which investigates use of unnecessary force. A STEEP PRICE is both compelling and politically relevant, a perfect addition to this beloved series. One of the strongest elements of Dugoni’s books has always been his ability to balance numerous plotlines, characters and twists without ever confusing or distracting the reader. In A STEEP PRICE, he is at his absolute best, juggling several timely, personal and riveting storylines without a single misstep. In a world full of police thrillers and crime fiction, this is what has always made the series stand out. Tracy Crosswhite and her team have never just been police officers, and Dugoni makes their personal lives every bit as fascinating as their lives on duty without ever sacrificing a single detail. Their continuous development over the course of the series is believable, relatable and endlessly riveting. It seems there is no stone left unturned by Dugoni, and his love for his creations leaps off the page. Longtime readers will adore following Tracy’s pregnancy; Dugoni is compassionate and thoughtful in his exploration of motherhood, and it adds a whole new depth to the series as a whole. It is hard to believe that I have been following Tracy’s journey for four years already. In some ways, it seems as if I have known her forever, yet at the same time I cannot believe Dugoni has written so much in such a short amount of time. 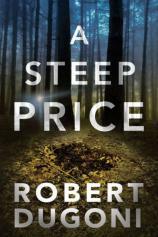 A STEEP PRICE is without a doubt one of the best books in the series, and I look forward to resuming this journey with her as long as Dugoni continues to share the stories of the Seattle Police Department.